Northern Exposure Fans, I was in the thick of Cicely, Alaska this past week! Northern Exposure was a quirky, surreal television series on CBS in the early 90's. It started out as a summer replacement show and went on for six seasons! The show was set in a small, remote (and fictional) town called Cicely, Alaska. The show was a "fish out of water" story with Jewish, New York City physician, Joel Fleischman coming to Alaska and clashing with the laid-back and quirky citizens of Cicely. I give you this background information because I found out that Ryan had never watched Northern Exposure and was not quite sure what it was about! It was filmed right here in Washington State in the town of Roslyn, about 90 minutes east of Seattle. Ryan and I drove out there on Tuesday for some camping and hiking. 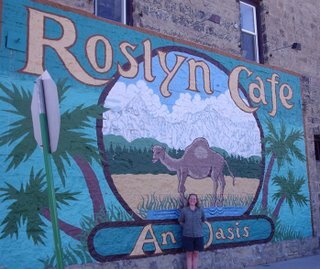 First stop was Roslyn of course so that I could bask in the locations of the television show. Joel's office is now a gift shop featuring Northern Exposure T-shirts etc. KBHR is just down the street and Ruth Ann's Store too! And the Brick is just like it was on TV. A Real Saloon. We didn't eat or drink there, maybe next time. We headed out of town and down some tricky gravel Forest Service Roads to Beverly Campground. We had our pick of the 13 sites and we chose the perfect campsite right beside a burbling little stream. We even had our own "beach". Ryan fixed our dinner and we camped out underneath the stars. The next morning, we headed to the Esmeralda Basin Trailhead. Any Trailhead that starts with a waterfall is sure to be a winner. Those of you who know me well, know that I like the flat trails, so this one was rated Easy in the guide books. I had my reservations as we started up hill! We soon entered lush meadows leading gradually upward. Lots of wildflowers, shooting star, phlox, indian paintbrush, columbine and some thistle too! Plus more that we weren't sure what the names were! I am not the rabid hiker that Ryan is, so I stopped at a backcountry campsite to relax and read a book while he continued up to the pass towards Lake Ann. In an hour or so, he returned and we returned together to the trailhead. He did bring back a treat for me. Snow from the higher elevations! It always pays to carry extra ziplocks with you. We had packed up our campsite and continued back to Cle Elum to stop at the Ranger Station and investigate where to go next. The folks in the Ranger Station were very helpful and we bought a few maps and continued out past Roslyn again to Lake Cle Elum. Another 13 miles on yucky gravel roads brought us to the Deception Pass and Cathedral Rock Trailheads. There was supposed to be a campground at the end of the road according to our maps, but when we got out there, it looked like parking for the trailheads only. We looked on every information board in the two parking lots out there and we didn't see anything saying that we couldn't camp! So we spread out our gear and decided to spend the night right there. The next morning, Ryan wanted to go on a long 14 mile hike and I wanted to do the shorter, flater lakeside hike, so we compromised. Ryan started off early and would hike a loop towards Hyas Lake. I would hike in to Hyas Lake, spend some time there and eat lunch and meet with him and we would hike out together. I should mention that although there were 3 or 4 cars at the Esmeralda trailhead, we only saw two other hikers while we were there and there were no people at all at our Beverly Campground on Tuesday evening. There were about 6 or 7 cars at the Deception Pass Trailhead and two sets of hikers hiked out and left on Tuesday Evening. When Ryan and I started out Wednesday morning, we had not seen anyone around. Ryan started off first as he had farther to go. I cleaned up our campsite and packed everything away before I started off in the opposite direction to Lake Hyas. 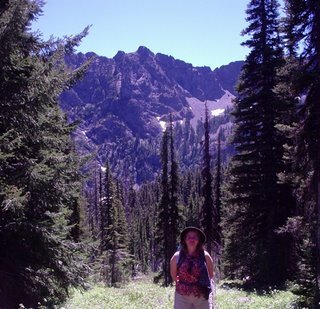 The trail was extremely flat and I was perfectly happy to walk along amid the wildflowers and forest! There were lots of creek crossings to make things interesting. Once I reached Lake Hyas, I found a comfortable spot to settle down and I got out my book to read. 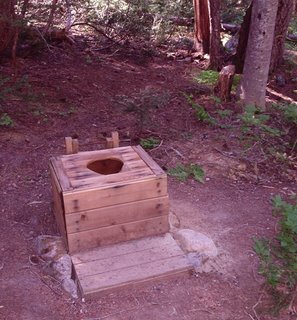 Lake Hyas is a backcountry camping spot and there were the cutest backcountry toilets. Ryan is an old hand at privies in the middle of the woods, but I am a newbie and I was fascinated! It was a gorgeous sunny day and I took off my shoes and waded in freezing waters of the lake. 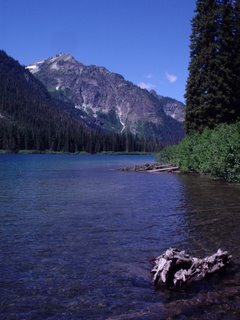 They don't call this the Alpine Lake Wilderness for nothing! I don't think anything could have persuaded me to go swimming in that cold water. But it was refreshing to get my feet wet after sitting in the hot sun for a while. Across the lake I had wonderful views of a raging waterfall. Ryan soon joined me and we headed back to the trailhead. On our way out, we ran into two sets of backpackers headed for Tuck and Robin Lakes. Ryan shared his adventures with me as we hiked out. That raging waterfall that I could see from Hyas Lake, he had to ford that river. It was quite the adventure! There are signs saying that it is a dangerous ford and horses and stock animals should not attempt it. Luckily, the water only came up to Ryan's knees, but it was very swift moving with lots of uneven terrain beneath the white water. A tricky thing to do. Ryan had his hiking stick to help him keep his footing. He ran into several people on the trail around Cathedral Rock. Also that part of the trail is a portion of the Pacific Crest Trail. So Ryan was very excited to have done a small portion of the PCT! We decided to head back to Seattle for the evening. We stopped in Issaquah at the Qdoba Restaurant for an awesome burrito for dinner and missed most of the 5 o'clock traffic into town. All in all, I hiked approximately 10 miles to Ryan's 25 miles this week.